This free preview of The Block Genesis is offered to our loyal readers as a representation of the valuable journalism & research our team produces and Genesis members receive daily. Want to see more? Join today. 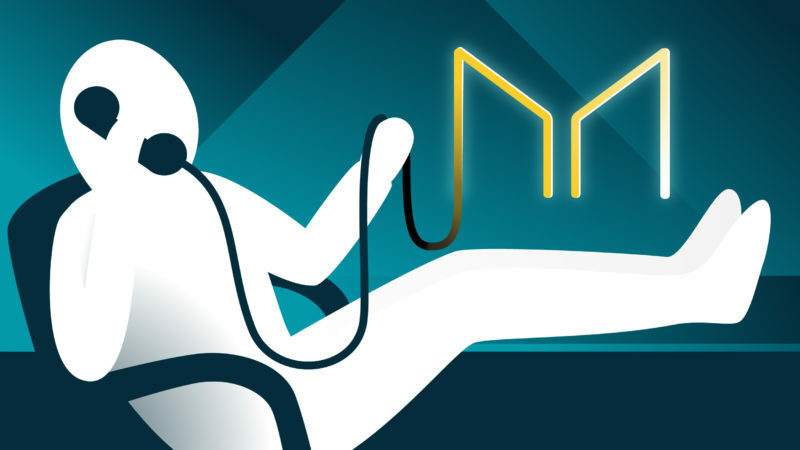 With Dai continuing to trade below $1 over the weekend, the MakerDAO Foundation initiated the three day polling process on Monday, setting out three options for the Stability Fee: keep at 3.5% APR, raise by 2% to 5.5% APR, or raise 4% to 7.5% APR. The polling process concluded an hour after this week’s Governance call, with stakeholders ultimately settling on a 4% increase. A total of 58 addresses participated, representing 0.58% of MKR holding addresses, of which 73.2% voted in favour of the highest hike, 17.9% in favour a 2% increase, and just 8.9% voting to maintain the status quo. Breakdown by stake produced similar results, with 75.6% of MKR bonded towards the highest interest rate increase. Of course, the pseudonymous nature of Ethereum addresses means that stake percentage is the more relevant metric. Weighting by vote per address would likely lead to a Sybil attack, whereby voters split their MKR holdings across multiple addresses in order to falsely signal superior support. It’s interesting to note that, although the polling process had yet to conclude, participants on the Governance call debated and discussed under the assumption that the 4% increase was all but guaranteed. While the poll did eventually resolve in favour of a 4% increase, I encourage future conversations to be more vigilant: there always exists a possibility that a large MKR holder will wait just before expiration before staking in favour of a less popular outcome, thereby taking advantage of near-complete information and the time-based nature of the voting process. The majority of this week’s call focused the imbalance between Dai’s supply and demand. 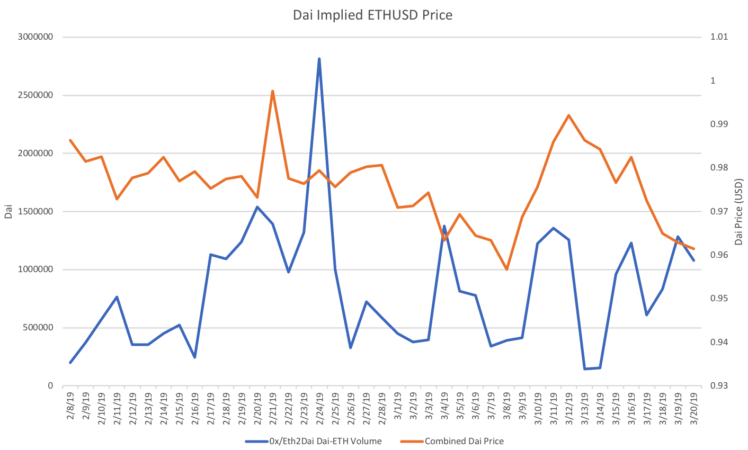 Although Dai price briefly trended upwards following last week’s call, it has since fallen back to the $0.96-$0.97 range measured by Volume Weighted Average Price across the 0x network of relayers and the Eth2Dai exchange. Perhaps surprisingly, this ~2% depreciation of price since March 16th came in spite of a net 698,901 DAI, or 0.75%, decrease in outstanding supply over the same period, the majority of which came the infamous CDP3228, who net wiped 640,000 DAI. 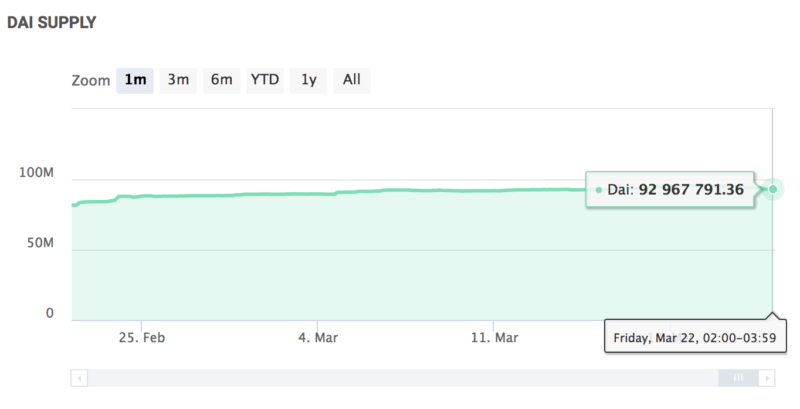 One would naturally expect Dai price to increase as CDP holders net purchase Dai to close out their positions, yet data presented shows no sign of abating price depreciation. Representatives from the Wyre Capital and Maker Foundation trading desks noted that inventories had remain largely flat, suggesting that the Dai purchases had not taken place on either spot exchanges or Over-The-Counter. One possible explanation is that, rather than acquiring Dai on exchange, those closing out CDPs instead borrowed Dai on Dharma Lever, where borrow rates are currently subsidized at 0.1% APR. Borrowing, rather than purchasing, would allow CDP holders to maintain long exposure to ETH. However, if Dai does return to its peg over the duration of the 28 loan period, Lever borrowers stand to pay roughly 4%, rather than the marketed 0.1%, on their debt. Data from Dharma somewhat, but not entirely, supports this theory, with 249,854 DAI issued in loans over the past 30 days. According to Dharma CEO Nadav Hollander, Dai borrowing demand has exceeded expectations to the point that they are now guaranteeing 6% APR on Dai loan offers. In subsidizing borrow rates 0.1% and thus disabling the market’s ‘invisible hand’, Dharma Lever should temporarily be considered an outlier among alternative lending platforms. However, as suggested in last week’s report, an aggregate reference rate of lending rates across other lending venues — dubbed Decentralized Inter-Protocol Offered Rate (DIPOR) — can serve as a valuable metric for assessing the impact of Stability Fee changes on the wider Dai economy. Compound, a decentralized lending platform that adjusts interest rates algorithmically according to outstanding supply and demand, is one such venue worth observing. Compound Dai supply volumes have fallen close to 1 million DAI since the latest stability fee hike to 3.5%, while borrow volumes have declined slightly over the same period. As a result, interest rates have risen for both suppliers and borrowers, with the former briefly reaching parity with the MakerDAO Stability Fee. At the time of writing, Compound supply rates are back down to 3.34%. This slight disparity in supply rates is perhaps to be expected as prospective lenders can always acquire Dai on exchange rather than paying 3.5% to generate Dai through a CDP, but the upwards trend in supply rates does nevertheless indicate that the latest hike, as well as the impending hike, may be having its desired effect. Multiple call participants posed questions regarding use cases for drawn Dai in the hope of understanding interest rate price sensitivity. A thorough analysis of wallet addresses could provide detailed insight, although at this stage most data indicates that the overwhelming use case is to leverage long Ether. In fact, we can already calculate the profitability of opening a CDP taking into account expected Ether price appreciation over different time periods. Under the assumption that Dai is trading at $0.95 and borrowers will have to repurchase at $1.00, the table below shows that a 50% APR Stability Fee would not be sufficient to deter purely rational market actors from opening a CDP if they expect more than 10% gains over the next month. Similarly, even a 100% APR Stability Fee would not be sufficient to stifle CDP demand if ETH is expected to increase more than 10% over the next week. Compound’s WETH market provides further insight into market sentiment, with just 6.25% of total available supply being lent out and supply interest rates at 0.44% APR. Low demand for WETH adds credence to the theory that there is currently a marked lack of interest from shorts. 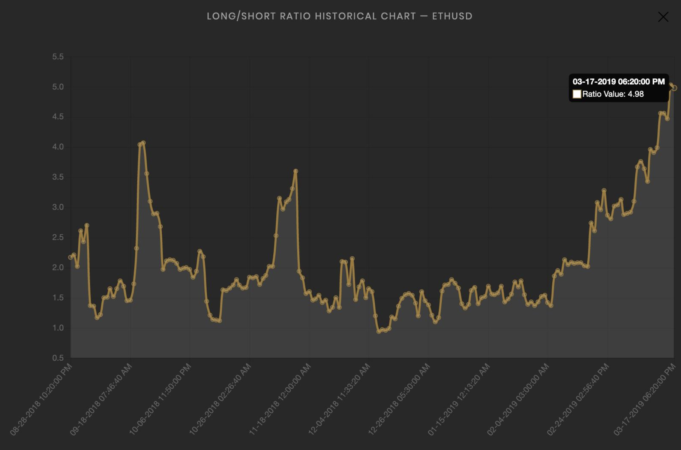 Meanwhile, this week, the ETH/USD Long:Short ratio on Bitfinex reached an all time high of 4.98:1, suggesting a significant imbalance between bulls and bears. Perhaps somewhat serendipitously, this imbalance could set up the conditions for a ‘long squeeze’, with speculators forced to close their positions in a falling market, causing a further cascade of price depreciation and, simultaneously, increasing demand for Dai. 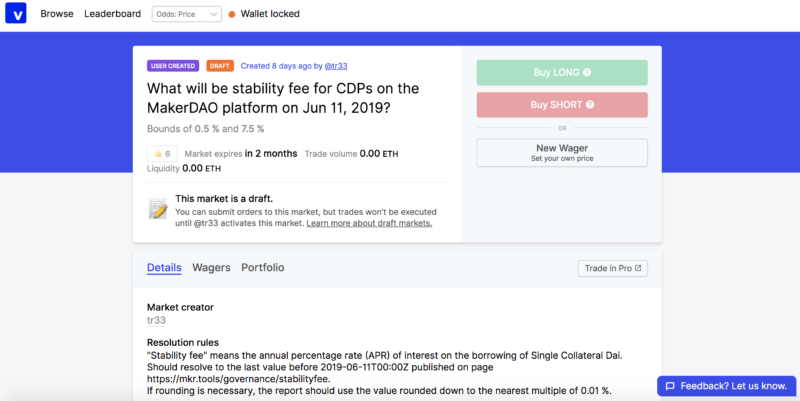 As the Stability Fee continues to be adjusted upwards, MakerDAO stakeholders should remain vigilant of CDP holders’ desire to hedge against rate increases through the futures market. 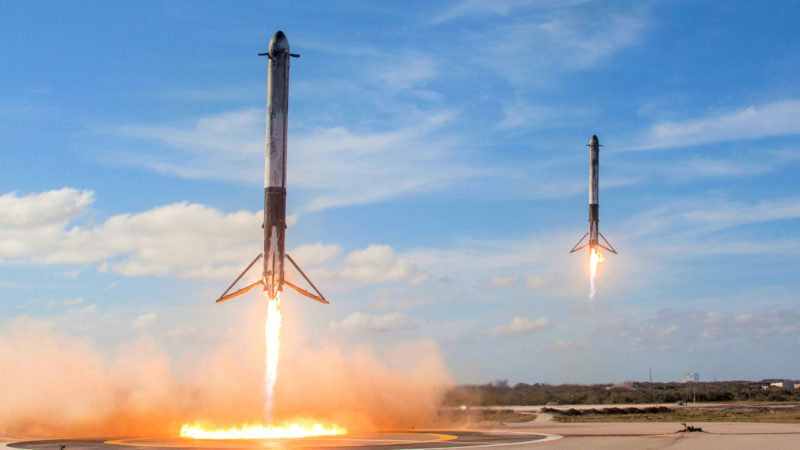 This week Veil, the Augur-based relayer, launched a preliminary draft for a scalar Stability Fee market and it is likely that binary markets — i.e. will the Stability Fee be adjusted upwards by X date — will similarly emerge in the near future. 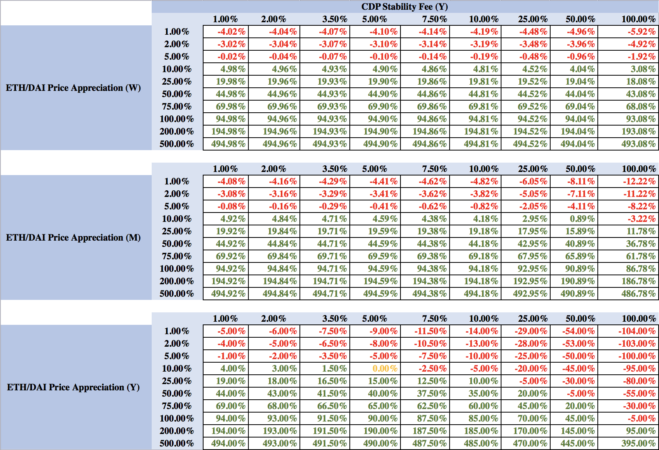 By purchasing shares in increased Stability Fee outcomes, CDP holders can offset any adverse effects from an interest rate hike, essentially setting themselves a fixed interest rate in what is designed to be a variable interest rate market. Considering the Stability Fee is currently the primarily tool in the MakerDAO monetary policy arsenal, these markets could spell trouble for future Dai stability, leading stakeholders to turn to alternative methods, such as increasing the liquidation ratio or lowering the debt ceiling, in order to engender stability. NB: In last week’s report I noted that the top 100 accounts collectively own 91.52% of MKR tokens. It should be clarified that the top 3 MKR addresses are: the development fund, the redeemer contract, and the voting contract. The latter two addresses should be ignored in the context of distribution analysis.